With all of the features that you would expect from a SLYDE...and more! 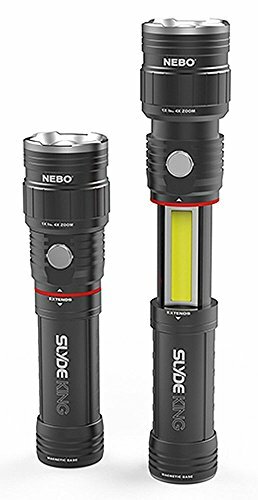 The SLYDE KING is equipped with programmable memory settings for each light mode, a new COB red light function, a 4x adjustable zoom and best of all...it's rechargeable! Work light automatically turns ON when opened. Powered by 1 Li-ion rechargeable battery included (3-4 hour recharge time). Micro USB to USB cable included. Length: Compacted: 6.875" / Extended: 9". Diameter: (Head) 1.75" / (Barrel) 1.25".